While some schools across the country find it alarmingly difficult to fill certified teaching positions, especially in mathematics and science, other schools struggle retaining the high quality teachers they already employ. As reported by the Learning Policy Institute, if the teacher attrition rate could be reduced from the current rate of 8% to 4%, closer to where it is in some other countries, U.S. hiring needs would decrease by around 130,000 teachers annually, cutting annual demand by nearly half. (Sutcher, Darling-Hammond, & Carver-Thomas, 2016)The brief, A Coming Crisis in Teaching?, goes on to suggest that reducing the teacher attrition rate in half could “virtually eliminate shortages” which, ideally, would allow for increased selectivity in hiring, boosting the quality of teachers in the classroom. How can your school play a role in retaining your best teachers? You, get creative! Here are a few innovative ideas for making your school’s teacher retention package emerge from the crowd. Hint: It’s not all about the money either. Although there are federal programs that offer loan forgiveness for public service employees, many of those opportunities require employees to work 5-10 years before receiving any of the promised benefits. Try offering additional loan assistance to your classroom teachers. “In the 2015 American Student Assistance survey, 76% of respondents said that if a prospective employer offered a student loan repayment benefit, it would be a deciding or contributing factor to accept the job.”(Freidman, 2016). Offering even a small portion of your teacher’s monthly loan repayment costs could produce a huge rebate in teachers deciding to remain at your school for years to come. They say money does not buy happiness, however, it CAN buy time…and extra time for teachers almost always produces happiness! A recent study by the National Academy of Sciences suggests that “people from various socioeconomic backgrounds benefit from making time-saving purchases.” Are there memberships you could provide to your staff decreasing the amount of after-work tasks? Take, for instance, meal preparation programs. Local companies like Fare & Square take the stress out of dinner. Fare & Square offers healthy meals delivered right to your doorstep in the Columbus, Ohio area. What teacher wouldn’t crave the benefit of ready-made dinner waiting on their front porch after a long workday? Other membership services like Amazon Prime simplify shopping with the click of a button. Offering these services, or similar ones, could help alleviate the stress of time management. Utilize community partners. Are there local gyms, tanning beds, chiropractors, or dental offices willing to offer discounted services, particularly for your staff? Are there local shops that can contribute in-kind donations like classroom rugs, pencils, dry erase boards, or copy paper? Are there opportunities to partner with neighboring housing complexes, making discounted leasing rates available for teachers deciding to live near the school? Is there a yoga studio in the area that could offer free classes once per week? Many community organizations and businesses are eager to get involved. Connect with them and make the ask. “National estimates have suggested that new teachers leave [the classroom] at rates of somewhere between 19% and 30% over their first five years of teaching.” (Sutcher, Darling-Hammond, & Carver-Thomas, 2016, p. 42) The best thing you can do for teachers is to meet their professional needs. Make sure all new teachers have a mentor teacher within the school building. They need the constant connection, shoulder to cry on, and think tank. Find out their areas of strength and areas of opportunity? Does your third grade teacher need a little tweaking in the area of classroom management? Does she need more professional development around engaging gifted students? Does your kindergarten aid need more guidance in the area of brain development and age-appropriate practices? A growing teacher is a happy teacher. Keep them happy by placing an emphasis on professional growth. Finally, REMEMBER, They Have Personal Lives Too! Educators are some of the hardest working service providers in the world. They deserve a break every now and then. Consider rewarding your teachers with a “recovery day” or a “recovery hour” every once in a while. Could you offer extra planning time once per week? Are there ways for other staff members to cover lunch, recess, and bus duty so that teachers can focus on grading or modifying lesson plans? A little consideration goes a long way. Seek out opportunities to give teachers more time during the school day to complete the typical “take home work”. What other ideas do you have? I’d love to hear how your school or district is prioritizing teacher retention. Comment below. 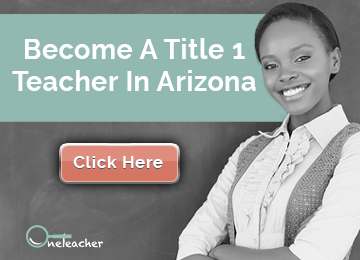 Are you looking for a Title I teaching opportunity? 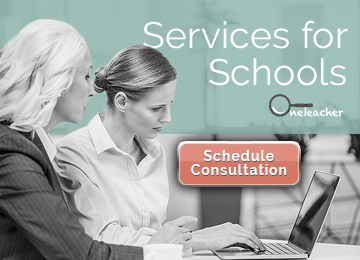 Contact One Teacher today, the go-to resource for teacher job placement. Apply now, or call us at 602-730-0949 with your questions. Freidman, Z. (2017, February 02). Student Loan Repayment: The Hottest Employee Benefit Of 2017. Sutcher,L., Darling-Hammond, L., & Carver-Thomas, D. (2016, September). A Coming Crisis in Teaching? happiness. Proceddings of the National Academy of Sciences, 114(32), 8523-8527.